This time with some lovely silver matte two-hole coin beads. I think the formal name for them is Disc Duo. A new offering from Potomac Beads. Unusual for me, I could actually think of ways to use these, which I generally don’t with the multi-holed beads. 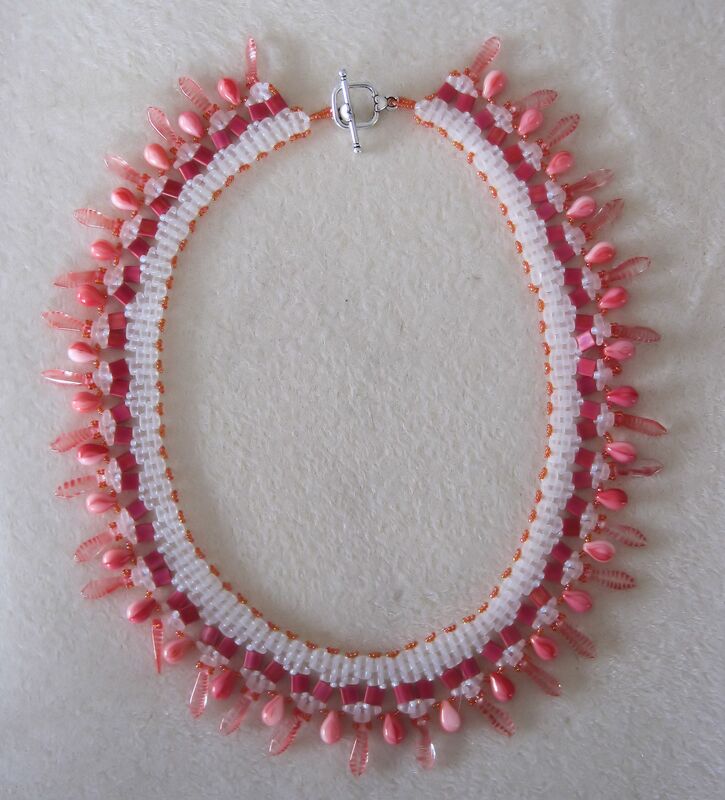 So, satin silver, chrome daggers and great crystal/copper seed beads. The necklace is hefty without being heavy; a nice quality feel. The most difficult part? Keeping my seed bead counts straight as the secondary fringe grew. Wear it with that silk charmeuse dinner gown, or a T-shirt! This is the companion necklace to Wedding Bells. It is was made for the Mother of the Bride. Weddings are such happy occasions! I am stumped. I have no idea what to call this piece. It’s another triangulation, stitched with a combination of herringbone and peyote. The beads are a mix of delicas, crystals and drops. It can be worn as a brooch (there’s a pin back) or as a necklace – that’s the gold loops showing at the top. Very versatile. Very bright. Very…confusing. Rather than leave it un-posted until my wracked brain comes up with a name, I thought it might be fun to involve the greater Blog-o-sphere community. So, it’s time for a little reader participation. What should this piece be called? This necklace reminds me of deep dark plums. Juicy and full of sugary goodness. Maybe that’s because I’m hungry? Or maybe it’s because I can see Spring budding forth outside the window, and I can’t wait for all the lovely fresh fruit to show up at the Farmer’s Market. Heck, I can’t wait for the Farmer’s Market to start up, and that’s several months away yet. 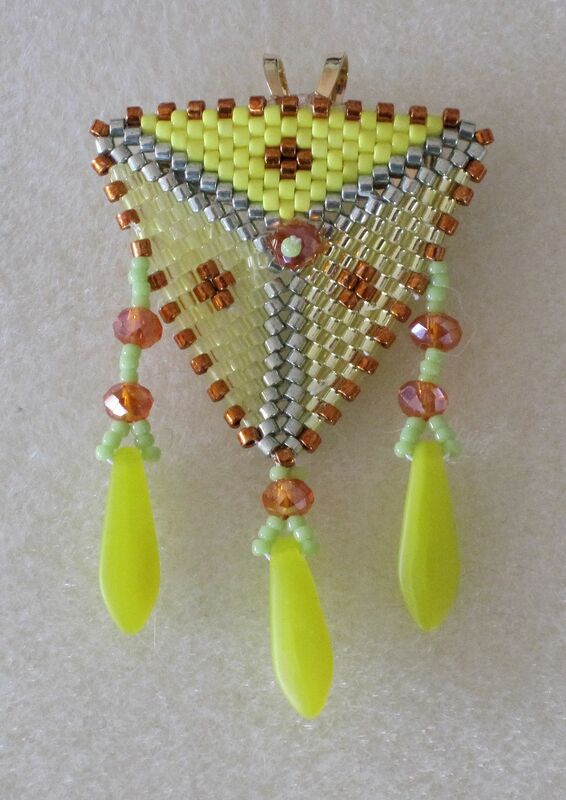 I shall just have to bide my time with beading. So, a little bit of square stitching. Simple and to the point, and the name implies. There are dark red drugs interspersed with tiny bronze seed beads. Once the overall length was determined, I went back and embellished the necklace with some dagger drops. The daggers are a color mix, some have a purple cast while others lean more towards bronze. This adds a bit more visual interest, and breaks up what could otherwise have been a monotonous progression. 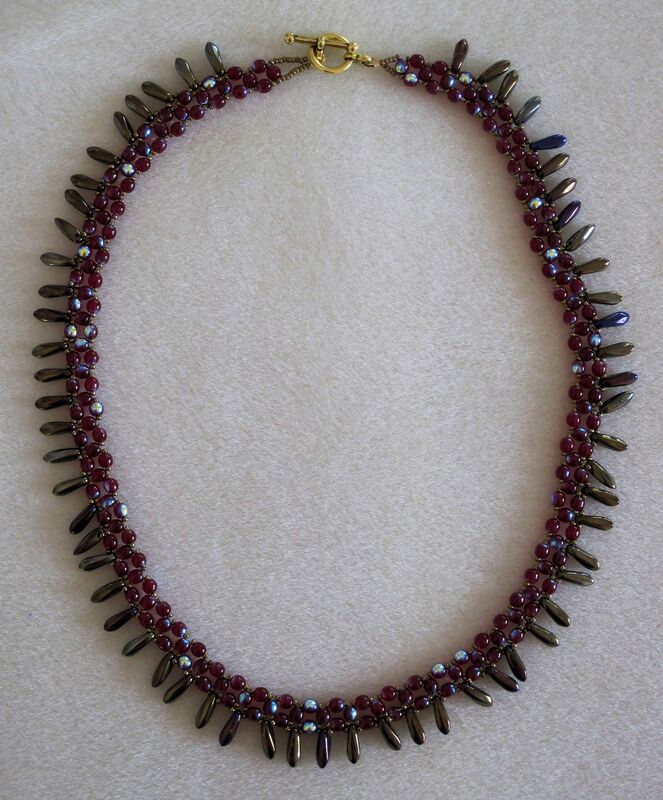 While this necklace may look a bit stiff, it is very fluid and pleasant wear. I’m not at all sure what type of mermaid lost this bracelet. Or maybe not a mermaid at all, but some other aquatic amphibian. In any event, I am ever so glad she did. I love the combination of warm dove grey with the retro mint green. Scales which feel smooth to the touch with the grain, and quite prickly against. There’s also a subtle bow to the whole piece, which gives even more dimension. 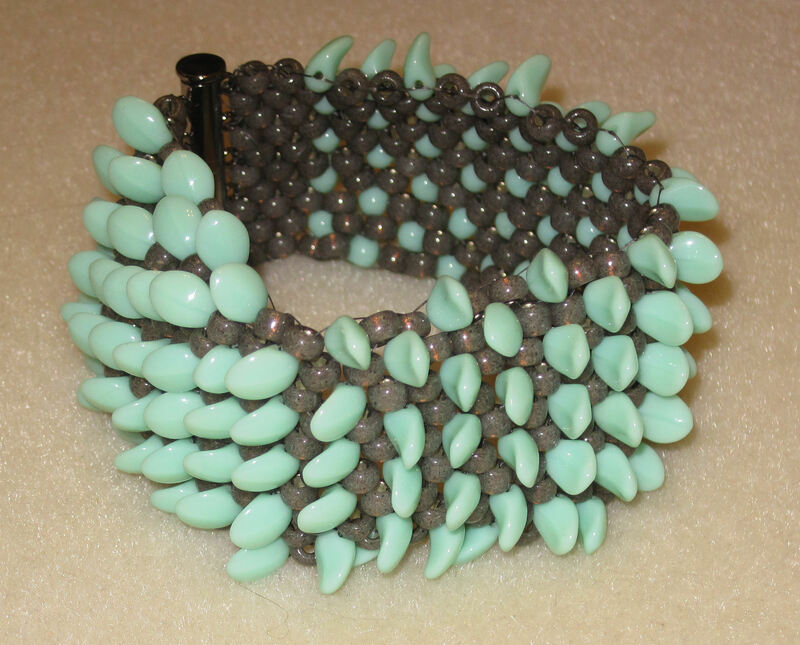 Composition: dove grey size 6 seed beads combined with minty fresh petal beads. The petals are quite directional, having a true front and back, which gives the scale dimensionality. The whole bracelet stitched in peyote and finished with a slide lock clasp. She’s fast! A flip of her tail and she disappears into the salty waters. She swims with the speed demons of the ocean – yellowfin tuna. Sleek. Fleet. Avoiding both nets and man to keep her seaworthy seclusion. I think she lost this bracelet while racing with her fishy friends. Who can get to the bottom fastest, perhaps? Either way, I must say I am glad she decided to part with her finery. Large daggers in both a matte and shiny finish, stitched together with 8° seed beads, the whole closed with a slide lock clasp. 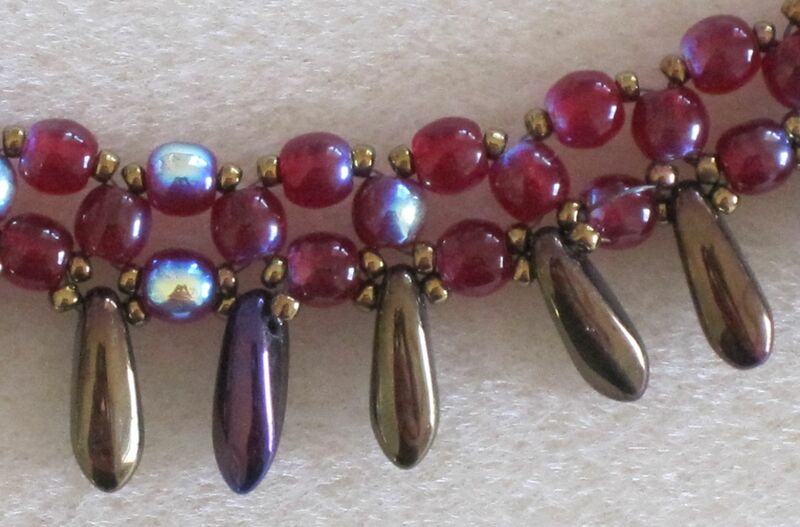 I like the combination of finishes on this bracelet. They provide textural interest. Moss and Lichen and Streams, Oh My! Leafy trees, dappled shade with a running stream beside her. She took it off just for a moment, then some scrub jays swooped down and made off with her finery. At least, that’s the story this bracelet is telling me. A more subtle rendition of the Mermaid bracelets. Still flashy, but in an understated way; for those times you know you’re on top of the world, and don’t need to shout. Small red daggers combined with dark gold drops, the whole melded together with color-lined size 8°s. The daggers run down the center for the most part, which I think makes the bracelet more wearable when you’re doing things with your hands. What I find interesting about this piece is that none of the colors are from the same family, and none of the beads have the same finish. Truly an example of the sum being more than the parts.